This Black/White Card Gift Box is a perfect compliment for your jewellery. It can comfortably accommodate most of rings. It is made from the reinforced high quality black/white cardboard. The insert inside is covered with high quality soft touch velour which accentuates the shine of your silver or gold jewellery and sharpens the lustre of the gemstones. This effect makes your jewellery "pop" out of the box! It has 1 slit in the middle for a small or large ring. 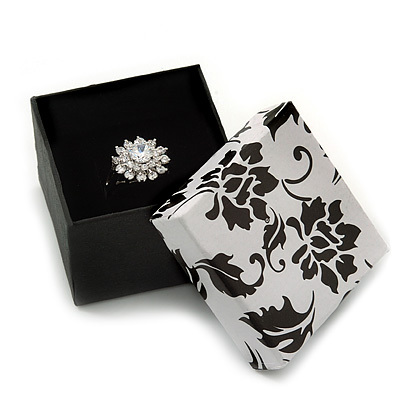 This Black/White Card Gift Box for Rings is a stylish and surprisingly inexpensive way to present your jewellery. You will be surprised by how much you get for such a small price!